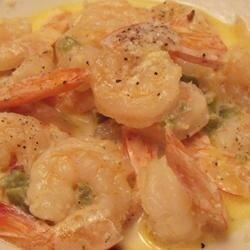 "Shrimp in a spicy cream sauce to be served as an appetizer with hot-baked French bread (for dipping), or over fettuccini (as a not-so-light meal). Fun to prepare in front of guests as a prelude to a nice seafood dinner! Use any hot pepper you like, Cajun seasoning, or even hotter!" Heat olive oil in a large skillet over medium-low heat. Add habanero peppers, and garlic, and fry for a few minutes to release the flavors. Add shrimp, and cook stirring constantly until pink, about 5 minutes. Season with chili powder, salt and pepper, stirring to evenly coat the shrimp. Stir in the cream, and cook over low heat until heated through, but do not allow to boil. Serve hot with bread slices. use caution with peppers...a glove is appropriate. i pulled the shrimp out and added a corn starch/cold water mixture to the "runny" sauce and it turned out fabulous. very easy to make and very good! i also added parsley and garlic powder. my boyfriend, who can be a picky eater, loooved this. SOOO Spicy! And good. I love the creamy sauce. Make sure you wear gloves when cutting the pepper, I made that mistake and my hands were burning for days! Mmmm. Mine became a Spicy Scampi soup.